When feeding cattle in stockyards or feedlots, you're looking for the animals to reach a target weight based on current market conditions. The feeding program depends on current weights upon entering the feedlot, the targeted market date and that date's target weights. For example, a calf at 550 pounds on entry might be targeted to weigh 1,150 pounds on the market date six months hence. The average steer calf arrives at the feedlot weighing approximately 550 pounds. If the calf is "finished" in six months at 1,150 pounds, Iowa State University Extension estimates, the animal consumed 49.3 bushels of corn, 724 pounds of hay, 2,050 pounds of modified distiller grain, and 128 pounds of mineral and feed supplement. The ISU Extension website notes that corn distiller byproducts are becoming an increasingly common element of feedlot rations. A yearling steer weighing 750 pounds upon arrival at the feedlot finishes at 1,250 pounds after five months. Each yearling steer consumes 47.7 bushels of corn, 426 pounds of hay, 1,812 pounds of modified distillers’ grain, and 97 pounds of mineral and feed supplement. 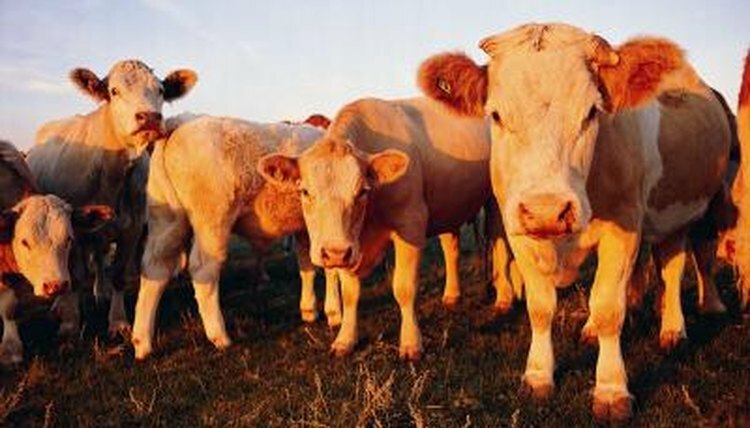 Cattle are generally fed at least twice daily; some operations feed three times a day. Frequency depends on overall consumption. Employees check the pens regularly. If twice-daily feeding is insufficient, a third feeding is introduced, at least temporarily. According to the Texas Cattle Feeders Association, a correct schedule determines that the amount of feed given to each pen ensures none is wasted and the cattle receive all the feed they can eat. Calves generally wean about three to four weeks before shipment to the feedlot. The traditional practice was feeding calves a concentrate for about a month before weaning rather than allowing them to continue nursing with no feed supplementation. According to the University of Missouri Extension website, calves fed the concentrate tend to exhibit "poorer feed efficiencies" once at the feedlot. It states that a more economical alternative consists of allowing calves to stay on the cow, each calf eating between 1 and 3 pounds of supplemental feed daily for a month or two prior to feedlot shipment. In the cattle business, feeding is all about weight gain. A steer calf, from arrival to finishing, should gain just under 3 pounds daily. A yearling steer should gain just over 3 pounds daily. Since hay and grain prices vary each year according to availability, so does the cost of feeding cattle. In years when hay is scarce, cattle might be slaughtered earlier -- under normal finishing weight -- if feed costs outweigh what the market bears for beef.